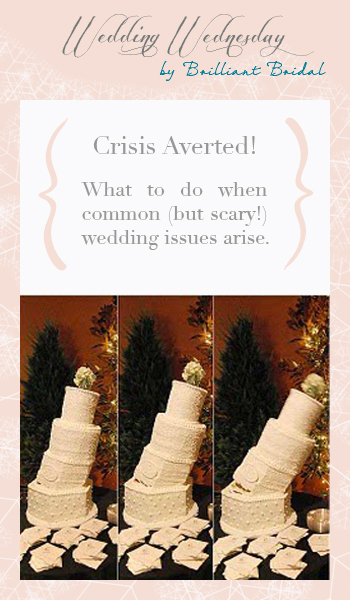 Wedding Wednesday - Crisis Averted: Help! I Have a Bully Bridesmaid! This is week two of our month long blog series "Crisis Averted!" If you are planning a wedding, it’s probably safe to say that you are feeling the pressure. There are so many little details to consider, it can make even the most type-A personality feel disorganized! As if the actual wedding details aren’t enough, there always seems to be underlying budget, family, friend or vendor drama surrounding an upcoming marriage. Don’t worry, though, because we are dedicating the whole month of November to sharing our advice on handling some common wedding issues. Hopefully our tips and tricks can help make this sometimes stressful experience a little easier! Help! I Have a Bully Bridesmaid! Is someone in your group of girls taking over the wedding plans with her bold opinions and unkind words? You may have a bully bridesmaid on your hands. Although brides usually seek the opinions of their bridesmaids, some friends tend to take advantage of their position by offering too much advice or advice that is catered to their own taste, not the brides. Or perhaps your upcoming wedding has awakened feelings of anger, jealousy or disapproval that your bridesmaid is wrestling with. The best way to handle a situation like this is to communicate! Approach the bully bridesmaid individually and remind them the purpose of the wedding is to celebrate you and your fiance and ask them to keep your interests at heart. Be sensitive but not enabling of any negative feelings they may be dealing with internally. Keep in mind that they should be honored to be a part of your special day! If they can’t celebrate as part of the wedding party, perhaps they would be better sitting in the seats as a guest. Join us again next Wednesday as we talk about what to do when you and your fiance's families do not get along.